Palm tree fronds can be easily and economically constructed from typical hardware store items. The faux palm trees are frequently used at tropical themed parties, or in summer store displays. The height of the palm tree fronds can be adjusted to fill the desired space. The decorations can also be used to add a tropical feel to indoor home spaces or in summer product related businesses. Select the pieces of PVC pipe to be used in the palm tree frond. Builders should determine the height and diameter of the completed project before shopping for the base materials. Power tools are required for cutting the thin plastic pipe--a typical hacksaw blade easily makes a clean cut on the material. Palm tree fronds, which will be approximately 1 to 2 feet tall, will require a 1-inch thick piece of PVC pipe. A 1 1/2- to 2-inch thickness of pipe is necessary for projects, which will be from 3 to 4 feet tall. Larger palm tree fronds, which will be at least 5 feet tall, will require a 3 to 4-inch thick piece of PVC pipe for sturdiness. Gather plastic containers for the palm tree frond base. Recycling an old sour cream or cool whip container to be used as the base for a small palm tree frond would provide a feasible foundation. Larger projects will require a thicker and wider base for the faux tree. Plastic buckets or plant pots will be able to hold the tree outdoors, and prevent tipping during stormy weather. If plant pots are used, the holes drilled into the bottom of the pot will need to be covered with a plastic liner or taped over before the necessary concrete can be poured into the pot. A bag of concrete should be mixed according to package instructions and filled to within an inch of the top of the plastic container. Curing the concrete is an important step in the project. After the mixture is poured into the pot, the PVC pipe needs to be set in the mixture immediately. The pipe will need to be held upright by tying it onto something sturdy while the concrete is allowed to harden for at least 24 hours. Know that palm tree fronds can be purchased from craft stores and home décor retailers. 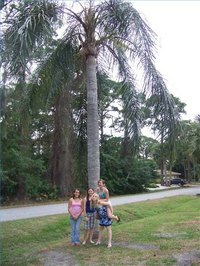 The heights of palm fronds vary, but should be approximately one third of the height of the tree to offer an authentic and scaled looking tree. The fronds can be attached to the tree by tying them into place with sturdy wire, and placing them inside of a hole drilled in the top of the pipe. The drilled hole should be no larger than absolutely necessary to defray movement and slipping of the palms. Tying a small weighted item onto the wire ends will also aid in keeping the palm tree fronds in place. Wrapping some type of covering around the pot as a decorative feature is the next step of the palm tree project. Faux grass, an artificial palm tree skirt, or burlap create a natural looking covering, and are durable for outside use. The selected covering should be secured tightly to the plastic container with hot glue. Further garnishment can be added to the top of the tree with coconut fiber or moss, which can be purchased at most craft or home improvement stores. The coconut or moss can be used at the top of the plastic container, as well as at the top of the tree near where the palm branches are secured for added decoration. The pipe can now be painted in a light beige shade to mimic the color of a real palm tree.